Sheet music discovered in 2009 identified as part of a childhood creation by Mozart, Kerstin Joensson / AP. Penguin Random House. On a bad day, all of humanity’s failures feel unbearably personal: coyotes wandering city streets due to encroaching wildfires, American citizens in Puerto Rico enduring another day without electricity or potable water in the wake of Hurricane Maria, neo-Nazis spouting hatred in American towns, world leaders testing missiles that would bring the deaths of millions of innocent people. We encounter bad news in the intimate glow of our cell phone screens, and then project our worries onto the flawed artifacts of our broken world: the for lease sign on the upper level of the strip mall, the crow picking at a hamburger wrapper in the gutter, the pink stucco walls of the McMansion flanked by enormous square hedges, the blaring TVs on the walls of the local restaurant. On bad days, each moment is haunted by a palpable but private sense of dread. We feel irrelevant at best, damned at worst. Our only hope is to numb and distract ourselves as well as we can on our long, slow march to the grave. On a good day, humankind’s creations make us feel like we’re here for a reason. Our belief sounds like the fourth molto allegro movement of Mozart’s Symphony no. 41, Jupiter: Our hearts seem to sing along to Mozart’s climbing strings, telling us that if we’re patient, if we work hard, if we believe, if we stay focused, we will continue to feel joy, to do meaningful work, to show up for each other, to grow closer to some sacred ground. We are thrillingly alive and connected to every other living thing, in perfect, effortless accord with the natural world. But it’s hard to sustain that feeling, even on the best of days — to keep the faith, to stay focused on what matters most—because the world continues to besiege us with messages that we are failing. You’re feeding your baby a bottle and a voice on the TV tells you that your hair should be shinier. You’re reading a book but someone on Twitter wants you to know about a hateful thing a politician said earlier this morning. You are bedraggled and inadequate and running late for something and it’s always this way. You are busy and distracted. You are not here. It’s even worse on a bad day, when humankind’s creations fill us with the sense that we are failing as a people, as a planet, and nothing can be done about it. The chafing smooth jazz piped into the immaculate coffee joint, the fake cracks painted on the wall at the Cheesecake Factory, the smoke from fires burning thousands of acres of dry tinder, blotting out the sun — they remind us that even though our planet is in peril, we are still being teased and flattered into buying stuff that we don’t need, or coaxed into forgetting the truth about our darkening reality. As the crowd around us watches a fountain dance to Frank Sinatra’s “Somewhere Beyond the Sea” at the outdoor mall, we peek at our phones and discover the bellowed warnings of an erratic foreign leader, threatening to destroy us from thousands of miles away. Everything cheerful seems to have an ominous shadow looming behind it now. The smallest images and bits of news can feel so invasive, so frightening. They erode our belief in what the world can and should be. As the first total solar eclipse in America in thirty-nine years reveals itself, an email lands in my inbox from ABC that says The Great American Eclipse at the top. People are tweeting and retweeting the same eclipse jokes all morning. As the day grows dimmer, I remember that Bonnie Tyler is going to sing her 1983 hit “Total Eclipse of the Heart” on an eclipse-themed cruise off the coast of Florida soon. Even natural wonders aren’t what they used to be, because nothing can be experienced without commentary. In the 1950s, we worried about how TV would affect our culture. Now our entire lives are a terrible talk show that we can’t turn off. It often feels like we’re struggling to find ourselves and each other in a crowded, noisy room. We are plagued, around the clock, by the shouting and confusion and fake intimacy of the global community, mid–nervous breakdown. Sometimes it feels like our shared breakdown is making us less generous and less focused. On a bad day, the world seems to be filled with bad books and bad buildings and bad songs and bad choices. Worthwhile creations and ego-driven, sloppy works are treated to the same hype and praise; soon it starts to feel as if everything we encounter was designed merely to make some carefully branded human a fortune. Why aren’t we reaching for more than this? Isn’t art supposed to inspire or provoke or make people feel emotions that they don’t necessarily want to feel? Can’t the moon block out the sun without a 1980s pop accompaniment? So much of what is created today seems engineered to numb or distract us, keeping us dependent on empty fixes indefinitely. Such creations feel less like an attempt to capture the divine than a precocious student’s term paper. If any generous spirit shines through, it’s manufactured in the hopes of a signal boost, so that some leisure class end point can be achieved. Our world is glutted with products that exist to help someone seize control of their own life while the rest of the globe falls to ruin. Work (and guidance, and leadership) that comes from such a greedy, uncertain place has more in common with that fountain at the outdoor mall, playing the same songs over and over, every note an imitation of a note played years before. But human beings are not stupid. We can detect muddled and self-serving intentions in the artifacts we encounter. Even so, such works slowly infect us with their lopsided values. Eventually, we can’t help but imagine that this is the only way to proceed: by peddling your own wares at the expense of the wider world. Can’t we do better than this, reach for more, insist on more? Why does our culture make us feel crazy for trying? Mozart composed an enormous volume of music over the course of his short life, working relentlessly from his youth to his death. He composed music as a child in a horse-drawn carriage, traveling with his father. He wrote music even when he was very sick or in debt. And though he is often portrayed as temperamental, unsteady, and erratic, his productivity never suffered. He found a way to shut out distractions and do the hard, patient work necessary to compose transcendent music. Even natural wonders aren’t what they used to be, because nothing can be experienced without commentary. In the 1950s, we worried about how TV would affect our culture. Now our entire lives are a terrible talk show that we can’t turn off. Imagine being told that your talent is a miracle, and you have just one job. You don’t have to be happy or successful or attractive or well-balanced as a human being. You don’t have to accrue wealth or maintain lots of friendships or seem impressive in any other way. You don’t have to tweet or share photos of your latest sheet music on Instagram or start a podcast about composing to increase your visibility and expand the size of your platform. You just have to do your one job to the best of your ability. Imagine being told that you have been given your talent by God, and you must honor God’s will by manifesting that talent in your creations. This would likely come as an enormous relief to many of us, the same way that witnessing a total eclipse all by yourself, in an empty field with no Wi-Fi, sounds like an impossible luxury. Working in a small, dark room, alone — it almost sounds thrilling next to a life jacked into the nonstop, infinite chattering matrix. Living simply today takes work. It takes work to overcome the noise that has accumulated in our heads, growing louder and more pervasive since we were young. It takes work to overcome the illusion that we will arrive at some end point where we will be better — more successful, adored, satisfied, relaxed, rich. It takes hard work to say, “This is how I am,” in a calm voice, without anxiously addressing how you should be. It takes work to shift your focus from the smudges on the window to the view outside. It requires conscious effort not to waste your life swimming furiously against the tide, toward some imaginary future that will never make you happy anyway. Even once you accept that you’re just another regular mortal and not some supernatural force who deserves to live like a king — a message encoded in the background noise of our daily lives, rich, poor, or somewhere in the insecure in-between — it’s still hard not to wish for something more exciting than calm acceptance. It’s hard not to wish for the romance of movies, the soul-bearing friendships of books, the egalitarian ideals of Martin Luther King, Jr., the miraculous talent of Mozart. Today Mozart might be seen as an outcast: His behavior was often impulsive, he made up his own mind about his compositions, he thought nothing of thwarting convention, he rarely had enough money, he died young. But when you listen to his music, it’s impossible not to believe that he was a joyful and deeply satisfied human being. Johnson backs this up: Mozart was so certain of his one job and his ability to do it that he didn’t care at all about how he looked, how he sounded, how he seemed. He treated his talent like it was a miracle. Many of us learn to construct a clear and precise vision of what we want, but we’re never taught how to enjoy what we actually have. There will always be more victories to strive for, more strangers to charm, more images to collect and pin to our vision boards. It’s hard to want what we have; it’s far easier to want everything in the world. So this is how we live today: by stuffing ourselves to the gills, yet somehow it only makes us more anxious, more confused, and more hungry. We are hurtling forward — frantic, dissatisfied, and perpetually lost. Our bewildered state doesn’t just injure us individually; it impedes our ability to work together for a better world. We can’t stand for justice and effect change until we’ve learned to push away empty temptations, shiny dead ends, and trivial distractions. As long as we’re perpetually assaulted by a barrage of news and tweets and texts, as long as commercial messages and smooth brands and profit-minded discourse are our only relief from our insecure realities, we’ll never develop the ability to live in the present moment. We have to cultivate compassion for ourselves and each other. We have to connect with each other in genuine and meaningful ways. But we also have to relearn how to breathe in the late summer air and feel the sunshine, to admire the swelling pink clouds and shut out the hiss of truck brakes, to sit on the ground and look up at the trees without looking ahead to what we’ll post on Facebook about it. You can have your eclipse and I will have mine. You can call yours a miracle and I will call mine a certain slant of light, like the one Emily Dickinson described: heavenly and oppressive and fleeting. “Do you see yourself as one of the dispensable people?” the therapist asks. Selin replies, “The point is, I don’t want to get involved in that question, and it’s all most people want to talk about.” She explains that not many people seem interested in “what you’re like.” They just want to figure out what you’re worth. The therapist’s misinterpretation of Selin’s problems presents one of the most succinct and terrifying summaries of our current delusions that I’ve found anywhere. We are encouraged to believe in our dreams, but we are assumed to dream in the same limited palette as everyone else. We are to view ourselves as unique snowflakes only as it facilitates more efficiently melting ourselves into bottled spring water. Our ultimate value is always quantifiable. All magic is lost to our sad economies of survival. Competition always supersedes connection. The therapist tries to soothe Selin by reassuring her that she will win eventually. This flavor of “sensitivity” ends up sounding more like a commercial for laundry detergent or a movie about superheroes: Selin is worthy, she is in the fight, she might yet remain on the boat with the survivors. There is no acknowledgment that the game is rigged, and that even if, by some small chance, she does “win” (however dispensables or indispensables might define winning), it’s unlikely to bring her satisfaction so much as even more anxiety and fear and alienation. Instead of treating her sensitive observation of her fellow students’ scarcity mentality as the miracle that it is, the therapist pathologizes her gift of sight. Selin has dared to be completely honest, only to encounter yet another human being who can’t place her outside of her position in a tireless race to the top. Selin wants more than the hopelessly mundane acquaintanceships that everyone around her seems to accept. She’s been corresponding online with a fellow student named Ivan whom she knows in real life, though they rarely talk. But in their letters to each other, which are so abstract and odd and lovely that they’re sometimes difficult to grasp, they attempt some form of mutual understanding, but achieve something even more powerful and important: a way of daring to be bigger and more brilliant than their circumstances and their peers in real life will allow. By celebrating their individual peculiarities and fears and odd perspectives honestly, they begin to experience each other’s strange, narrow views—and flaws and shortcomings—as engrossing and important and even bound- less. They treat each other the way Mozart’s father treated him. They say to each other, “Whatever is here, even when it feels little dark, even when it confuses me, I have chosen to view it as divine.” Their connection is a kind of a miracle, against a landscape dominated by people more like the therapist— people with good intentions who nonetheless tell stories that lead in circles, further and further away from the truth. If we didn’t succumb to our culture’s perplexing, destructive messages, something might shift. We might find ways to support each other more radically, more selflessly, without distractions, without anticipating a celebratory end point: That might allow us to generate the kind of beauty and connection and honesty that Dickinson and Mozart and Stegner brought us, the kind of blazing majesty that burns through the confusion and bewilderment, that feels intimate and personal, that lights up each new moment with endless possibility. We are living in a time of extreme delusion, disorientation, and dishonesty. At this unparalleled moment of self-consciousness and self-loathing, commercial messages have replaced real connection or faith as our guiding religion. These messages depend on convincing us that we don’t have enough yet, and that everything valuable and extraordinary exists outside of ourselves. It’s not surprising that in a culture dominated by such messages, many people believe that humility will only lead to being crushed under the wheels of capitalism or subsumed by some malevolent force that abhors weakness. Our anxious age erodes our ability to be open and show our hearts to each other. It severs our ability to connect to the purity and magic that we carry around inside us already, without anything to buy, without anything new to become, without any way to conquer and win the shiny luxurious lives we’re told we deserve. So instead of passionately embracing the things we love the most, and in so doing reveal our fragility and self-hatred and sweetness and darkness and fear and everything that makes us whole, we present a fractured, tough, protected self to the world. Our shiny robot soldiers do battle with other shiny robot soldiers, each side calling the other side “terrible,” because in a world that can’t see poetry or recognize the divinity of each living soul, fragility curdles into macho toughness and soulless rage. All nuance is lost in a fearful rush to turn every passing thought or idea or belief into dogma. Against this landscape, anything that celebrates the wildness and complexity of the human soul is worthy of celebration. This is true in a global sense, in communities, and it’s true within a single human being. The antidote to a world that tells us sick stories about ourselves and poisons us into thinking that we’re helpless is believing in our world and in our communities and in ourselves. We must reconnect with what it means to be human: fragile, intensely fallible, and constantly humbled. We must believe in and embrace the conflicted nature of humankind. That means that even as we stop trying to live our imaginary, glorious “best lives,” we still have the audacity to believe in our own brilliance and talent and vision — even if that sometimes sounds grandiose, delusional, or unjust. We have to embrace what we already have and be who we already are, but we also have to honor the intensity and romance and longing that batter around inside of our heads and our hearts. We have to honor the richness of our inner lives and the inherent values that are embedded there. But we should also aim to create a self and a life and an artistic vision that aren’t an escape from ordinary life, but a way of rendering ordinary life for people of every color, shape, size, and background more magical to them. In order to do that, we have to see that every human is divine. We have to train ourselves to see that with our own eyes. It will fuel us, once we see it. The ordinary people around us, the angry ones and the indifferent ones, the good ones and the bad ones, will start to glow and shimmer. We are called to plant these seeds in our world: to dare to tell every living soul that they already matter, that their seemingly mundane lives are a slowly unfolding mystery, that their small choices and acts of generosity are vitally important. It’s important to recognize that even in the most compromised-seeming relationships and situations, even in the most imperfect life circumstances, you can find sustenance and grace. Even when you feel polluted by a repetitive, aggressive world and alienated from the people within it, if you look closer there is something real and beautiful there, some attempt to feel, to connect, to improve the world we have. Did Mozart truly believe that his musical gifts were a miracle? Perhaps he simply resolved to believe in them the way his father did. That’s the kind of faith we require: We have to believe each and every day, in spite of a steady onslaught of setbacks and discouragement. We have to believe in our gifts. We have to believe in our peculiarities and our flaws. We have to believe in our capacity to love. We have to believe that what we do and how we live matters, like a once-in-four-decades phenomenon, like a miracle. It is necessary to make an imaginative effort which runs contrary to the whole contemporary trend of the art world: it is necessary to see works of art freed from all the mystique which is attached to them as property objects. It then becomes possible to see them as testimony to the process of their own making instead of as products; to see them in terms of action instead of finished achievement. The question: what went into the making of this? supersedes the collector’s question of: what is this? Here is how you will start: You will recognize that you are not headed for some imaginary finish line, some state of “best”ness that will finally bring you peace. You will see that you are as much of a miracle as Mozart was. You will remember that bit of advice lurking inside one of Shirley Jackson’s dark novels: “Somewhere, deep inside you, hidden by all sorts of fears and worries and petty little thoughts, is a clean pure being made of radiant colors.” You will feel this and know it in your heart and pass this feeling along to the people around you. You will breathe in this moment — this imperfect, uncertain, not-quite-right, heavenly moment. You will say to yourself, “It is enough.” And it will be. From the Book: What If This Were Enough? by Heather Havrilesky. Copyright 2018 by Heather Havrilesky. To be published by Doubleday, an imprint of The Knopf Doubleday Publishing Group, division of Penguin Random House LLC. 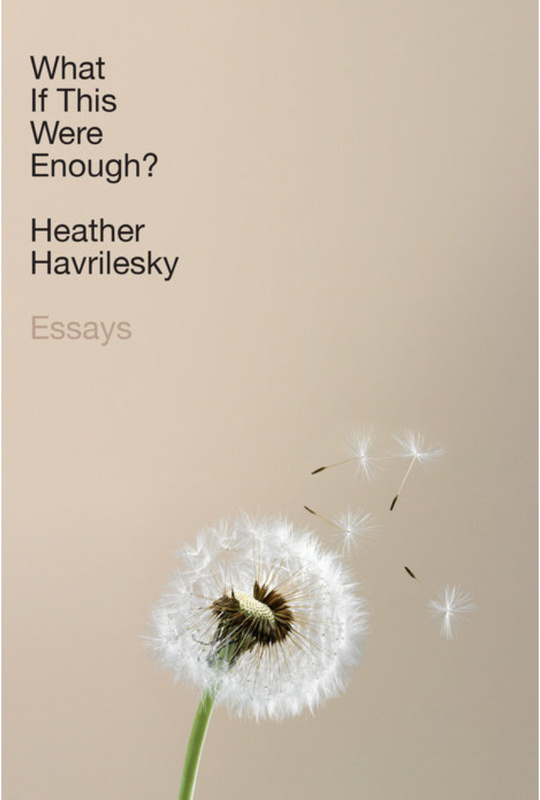 Tags: essay collection, Heather Havrilesky, What If This Were Enough?